GOP Presidential candidate, Mitt Romney, created a buzz this weekend with his pick of Republican Congressman, Paul Ryan (R-Wis) as his vice presidential candidate. Rep. Ryan is mostly known for his budget proposal, The Path to Prosperity, submitted as Committee Chair of the House Budget Committee. One key factor in the presidential election will be a Republican proposal to privatize Medicare. Medicare is one of the most costly and popular Federal programs. It currently covers 48.7 million senior Americans. Ryan has proposed raising the Medicare-eligibility age to 67 and giving retirees the option of buying private healthcare through a Medicare voucher program. The start date for the voucher program kicks in in 2023. However, polling (particularly those in swing states) indicate that voters disapprove of cuts to Medicare as well as attempts to privatize Medicare. In the meantime the same budget program plans to cut $1.4 trillion in Medicaid benefits between 2013 and 2023. Most of this would occur by repealing the Affordable Care Act and caps on federal spending for Medicaid. The caps on federal spending would occur in the way of block grants to states. States would receive less federal dollars, but would have more flexibility in administering Medicaid eligibility and payments. States would likely have to reduce payments to providers, reduce Medicaid eligibility and/or provide less extensive coverage to beneficiaries. 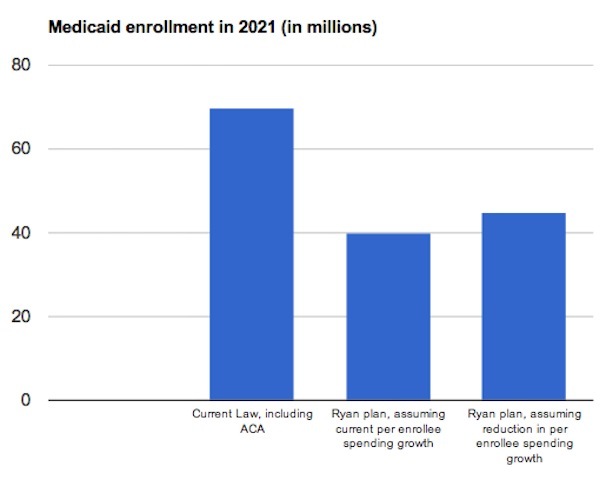 Ryan’s cuts could mean 30 million Medicaid beneficiaries would lose coverage. Currently, the Medicare system works like this. Seniors and qualified disabled individuals are entitled to a defined benefit package. The benefit package consists of Part A (covers in patient care; no premium where enrollee or spouse contributed through payroll taxes during the working years); Part B (covers other medically necessary care; some premium payments based on income) and a Part D drug benefit plan (some premium payments based on income). Medicare operates a traditional Fee for Service plan, although Medicare has experimented with a private Medicare Advantage plan. Under the Ryan plan, private plans would be required to cover the actuarial equivalent of the current Medicare fee for service plan, although not necessarily the same benefits. However, it is unclear whether the current premium payment for Part B and Part D would remain the same under the Ryan plan. For more information on the current Medicare program and proposed changes from the Ryan plan see the Kaiser Foundation website.